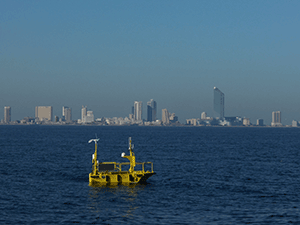 A lidar buoy deployed off the coast of New Jersey has provided observational data that, in conjunction with data from another buoy, will help inform wind production capability for offshore locations. The winds off the nation's coasts, which blow harder and more uniformly than winds on land, have the potential to provide more than 2,000 gigawatts of generating capacity. However, before offshore wind turbines can be deployed to harness this energy, researchers must answer important questions—such as how much wind energy a turbine can capture at certain offshore sites. To help answer this question, DOE's Wind Energy Technologies Office commissioned PNNL to deploy two research buoys off the New Jersey and Virginia coasts. The buoys were equipped with advanced scientific instruments for a multitude of research activities, such as measuring wind speed at multiple heights as well as air and sea surface temperature. The Virginia buoy returned in 2016 after 19 months collecting data 42 kilometers (km) off the Virginia shore—providing the first open-ocean observations of hub-height winds over a full annual cycle in the United States. In early 2017, the New Jersey buoy returned from a 15-month deployment 5 km east of New Jersey. During the past year, the team has looked at wind behavior and other variables of this data set. In the case of wind behavior, the team found that the New Jersey winds were generally similar over seasons to those off the Virginia coast, despite being measured in a subsequent year. The strongest winds were observed from the south-southwest (occurring in the warmer months) and northeast-northwest (occurring in the colder months). To address factors that control wind variability, the team observed that for both the New Jersey and Virginia coastal locations, onshore flow conditions—which result in wind blowing from the direction of the warm Gulf Stream over the cooler sea water near shore—showed that most of the time the air was warmer than the water. These conditions reduce the drag of the ocean on the winds and impact how wind increases with height. The team also noted that these conditions were more common for the Virginia deployment than the New Jersey deployment, either because of differences from year to year or—more likely—Virginia's closer proximity to the much-warmer Gulf Stream. These data will help validate wind predictions derived from computer models, which have historically relied on limited real-world observational data. The data will also bolster the findings that will be obtained from future buoy redeployments, and PNNL has received funding from DOE to install more powerful lidars on the buoys this fall to support these activities. The lidar upgrade will include validation of the new systems consistent with practices recommended by the Carbon Trust.